Hundreds of thousands of motorcyclists roared in the D.C. area for the annual Rolling Thunder ride to honor veterans and fallen service members. WASHINGTON - Hundreds of thousands of motorcycles roared into the D.C. area Memorial Day weekend for Sunday's 31st annual Rolling Thunder. 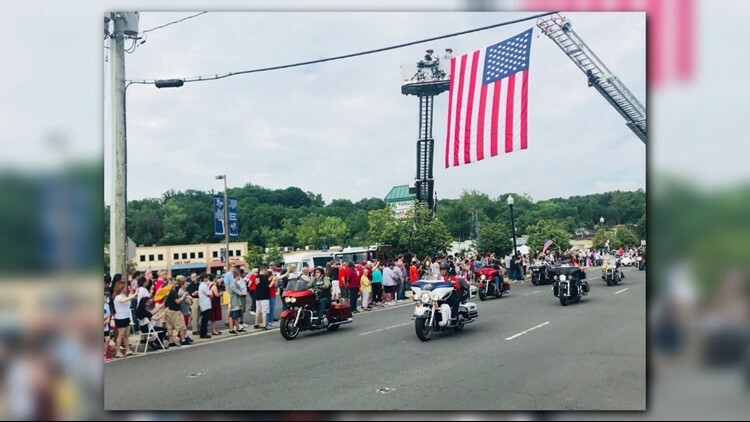 For many bikers, the drive to Rolling Thunder made a stop in Fairfax, Va., where the Ride of the Patriots started 20 years ago with just a handful of bikers. “Just a couple of guys getting together to go down to the Pentagon to ride in Rolling Thunder, but then it got a life of itself, bigger and bigger and bigger,” said Don Withrow, one of the organizers of the Ride of the Patriots event. Now thousands gather for the parade and convoy. They start in Fairfax and then are escorted by police to the Pentagon, where they meet up with about 500,000 bikers for the Rolling Thunder ride to the National Mall. Faith Guttierez said it’s a dream come true to be in the D.C. area riding a purple motorcycle, which is her daughter's favorite color. Her daughter, Charity, fell unconscious in her sleep when she was 13 years old. At the time, Guttierez was stationed in Japan. Charity lost oxygen to her brain and needs constant care. “We’ve been taking care of her at home for 29 years. We’ve always wanted to come to D.C. for Rolling Thunder. We’re so excited to be here,” Guttierez said. Charlie Lambert has come to town for the ride about six times. He brings fellow Vietnam veterans with him to help them heal. "It’s so heartwarming to see all these people riding for this purpose," Lambert said. Rolling Thunder was started in 1987 by two Vietnam veterans who wanted to honor and bring attention to their fallen brothers who never made it home.